Have you ever heard of Professor John Van? He was awarded prestigious Nobel Prize for explaining the working of NSAIDs like Aspirin. He studied the blockage of enzyme cyclooxygenase (COX-1) and itвЂ™s after effects due to the usage of Non-steroidal anti-inflammatory drugs. These drugs are easily available without the medical prescription also in most of the countries and are commonly used for treating fever and body pains. As the name itself suggests, they are different from steroids. Unlike steroids, these are non-narcotic. These no-addictive drugs helped medical sector immensely and after John VanвЂ™s contribution, more than thirty medicines were entered into the market. By blocking COX-1, prostaglandins (PG) will be formed whose lifespan is very less. These autocoids and PGE2 are responsible for inflammatory conditions. The side effects of these tablets include but not limited to gastrointestinal, eye related problems, hematopoietic disorders etc. ThatвЂ™s the reason why the usage of these tablets was not recommended for long time and doctors confine their usage to shorter periods. But this wonвЂ™t be a problem anymore. The latest discovery of COX-2 enzyme had minimized these side effects. The usage of NSAIDs is not limited to treatment of fever and body pains. Headache, back pains can also be relived using these medicines. Some Arthritis patients regularly use these medicines to subside their pains (in knee joints). Pains due to injuries or tissue loss can also be subsided by using these tablets. Patients suffering from muscle stiffness and injuries like Tennis-Elbow also prefer these pills for quick recovery. These tablets are even given to newly born babies if their ductus arteriosus is still open after birth. Some researchers are still trying to prove that these pills help in decreasing cardiovascular diseases and colorectal cancer. NSAIDs should not be used if the patientвЂ™s age is greater than 50 and had gastrointestinal problems in past. It is better not to take NSAIDs if (s)he is suffering from bowel disturbances. In case of stomach bleeding or ulcers, these pills are not at all suitable as they complicate the diseases. Patients who are suffering from problems like hypertension and kidney related disorders should avoid these pills. Medical experts wonвЂ™t recommend these pills in case of pregnant mothers and heart stroke patients. Patients who are on other medications like quinolones should not take NSAIDs as the combination can breakdown the entire nervous system. One must note that though Paracetamol is over the counter drug and easily available, it is not considered as NSAIDs pill because of its little anti-inflammatory property. But medicines like aspirin, ibuprofen, naproxen etc. belong to NSAIDs group. Based on the chemical compositions used, the half-life of some NSAIDs was close to 2-3 hours whereas the half-life of some NSAIDs pills was close to 50-60 hours. During 1990вЂ™s, doctors used to prescribe heavy doses of NSAIDs after surgery to relieve pain. However with the heavy usage of NSAIDs; patientвЂ™s suffered from dyspepsia and several other health problems. Upper gastrointestinal (GI) ulcers and bleeding were commonly reported in those patients. Some patients even died because of heavy usage of NSAIDs. It is still not recommended to take COX-1 and COX-2 NSAIDs simultaneously. NSAIDs except Aspirin have negative impact on heart if they are used for longer durations. Men, who use NSAIDs regularly, are potentially at risk of suffering from sexual (esp. ED) problems. Even this was scientifically proved (after taking so many factors into consideration). It is proven that medicines with COX-2 are having analgesic and antipyretic effects also. COX-2 Drugs were recently approved by FDA, USA. After the discovery of COX-2, several new medicines were produced and unlike the earlier NSAIDs, the side effects were significantly reduced. COX-2 medicines were proved to be safer than COX-1 medicines. Even the doctors are prescribing these COX-2 medicines only because of their advantages over COX-1 medicines. There is a clear difference in DNA and mRNA structures of these two but the end results are same. Even the structure of these two enzymes is almost 60% similar. The effects of these enzymes on arachidonic acid are almost same but their functionality is different. COX-2 is localized to nuclear membrane and endoplasmic reticulum. COX-1 is localized to later one only. For prostaglandin synthesis, these two use different versions of arachidonate. The best thing about COX-2 is it doesnвЂ™t affect the prostaglandins that cause these GI problems in any way. It just stops the synthesis and the user wonвЂ™t face any discomforts like GI problems or irregular bowel moments. 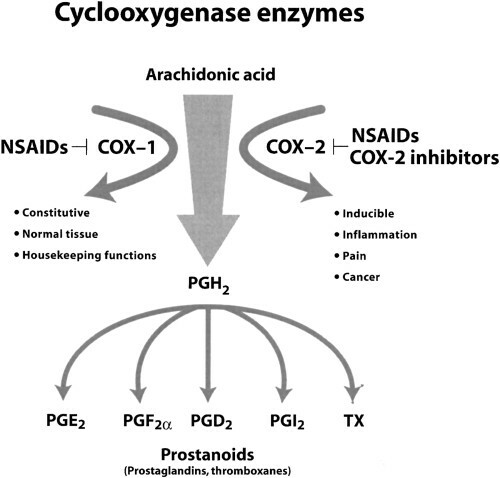 Inhibition of cyclooxygenase (COX) is the main function of NSAIDs. Frankly, there are several aspects of the working of NSAIDs are yet to be revealed. Along with COX-3 pathway, several other innovative models were being proposed to explain the working of NSAIDs. and actions of COX-1 and COX-2 enzymes. However, dermatologists are in the opinion that by knowing the complete functions of COX, several skin diseases can be treated (including Psoriasis). Even dermatologists find it difficult to cure Psoriasis and in most of the cases, they were successful in reducing the effects of Psoriasis instead of completely curing it. Though usage of Topical creams on infected areas has some positive effects; they are not 100% successful in completely healing the ill-effects of Psoriasis. Patients suffering from psoriasis face not only physical discomfort but also mental disturbances. They canвЂ™t sleep properly and the way their family members treat them also plays a crucial role in healing. Little or no effect even after taking medicines for months can seriously affect their mental balance. The embarrassment they face in their daily life can affect their self вЂ“confidence also. Physical discomfort and regular scratching can even lead to more outbreaks. Patients suffering from psoriatic arthritis showed positive results with COX-2 NSAIDs pills when compared to COX-1. Though the exact reason for this have to be researched, it is creating new hopes in Psoriasis and Arthritis patients. 1. Vane JR. Inhibition of prostaglandin synthesis as a mechanism of action for aspirin-like drugs. Nat New Biol. 1971;231:232-235. 2. Portanova JP, Zhang Y, Anderson GD, et al. Selective neutralization of prostaglandin E2 blocks inflammation, hyperalgesia and interleukin 6 production in vivo. J Exp Med. 1996;184:883-891. 3. Raz A, Wyche A, Siegel N, et al. Regulation of fibroblast cyclooxygenase synthesis by interleukin-1. J Biol Chem. 1988;263: 3022-3028.